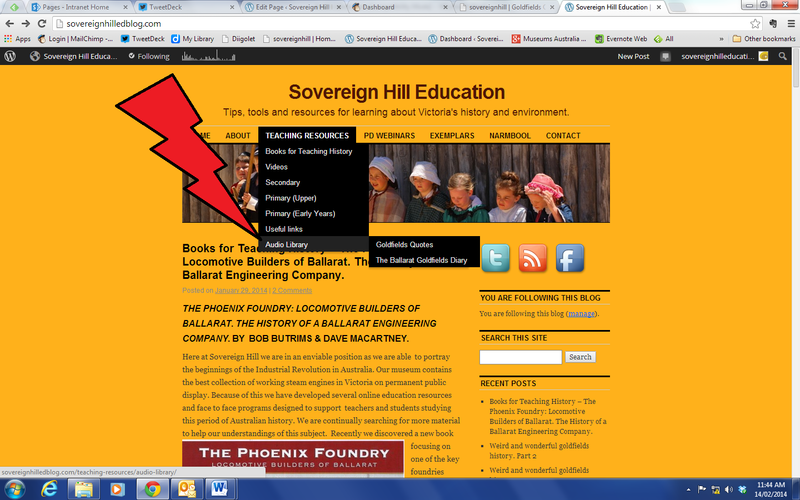 ← Books for Teaching History – The Phoenix Foundry: Locomotive Builders of Ballarat. The History of a Ballarat Engineering Company. We are in the process of updating our website, and have decided to transfer our archive of audio and video files from the website to our blog. This project is going to take quite a long time to complete. You will be able to monitor our progress as we go. We have created three new pages which we will continually add to over the next few months. Access to these pages is via the teaching resources tab near the top of the home page (As per the screenshot). To begin with we have been transferring the files in the order they were loaded on the old website. If there are any files that you have lost access to, please email us and we will prioritise your request. These files have been created to make primary sources of information more accessible to students. Thank you for your patience as we work our way through this transfer. Thanks for the helpful information about the re-designing of the website and the Blog. We use these resources in 3rd term every year, so I’m so grateful that I was able to find them easily in their new location.